It's a long road from the Institute of Plasma Physics (ASIPP) in Hefei, China to the ITER site in southern France: 500 kilometres by route to the port of Shanghai; some 10,000 nautical miles from Shanghai to the port of Marseille-Fos; another hundred kilometres for the last leg of the journey, from Fos to the ITER site. The distance was covered by trucks and the container ship Lyra in 38 days. 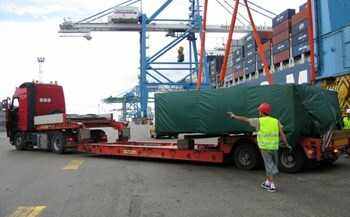 Three crates that had been loaded at Hefei on 25 April were delivered to the Poloidal Field Coils Winding Building on Monday 3 June, three days ahead of schedule. The crates contained the first batch of ITER items delivered by ITER China to the European Domestic Agency Fusion for Energy (F4E): 737 metres of dummy conductor, in three lengths, to be tested in a mockup of poloidal field coil number five (PF5). The 14.5-tonne load was also the first ITER item to enter the large on-site winding facility. 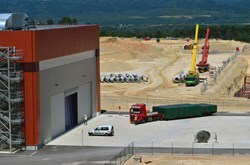 ... and delivered six hours later to the door of the PF Winding Facility on the ITER site. "The conductor will be used to test the whole fabrication process," explained Neil Mitchell, head of the ITER Magnets Division, as the crates were being unloaded and inspected. "This copper conductor will be wound, tested for tolerance, insulated, impregnated under vacuum and formed into a 'double pancake' in the same way the actual superconducting niobium-titanium conductor will be handled by F4E at a later stage. What matters here are the mechanical properties, which are similar in both the copper dummy and the actual superconductor." An ITER load, even when it's only a dummy component destined for mockup testing, is not an ordinary load. The transport crates were equipped with several monitoring devices to record movement and accelerations throughout the journey; other systems monitored the pressure inside the conductors, which are filled with pressurized inert gas, to confirm that there was no contamination by damp or salt. 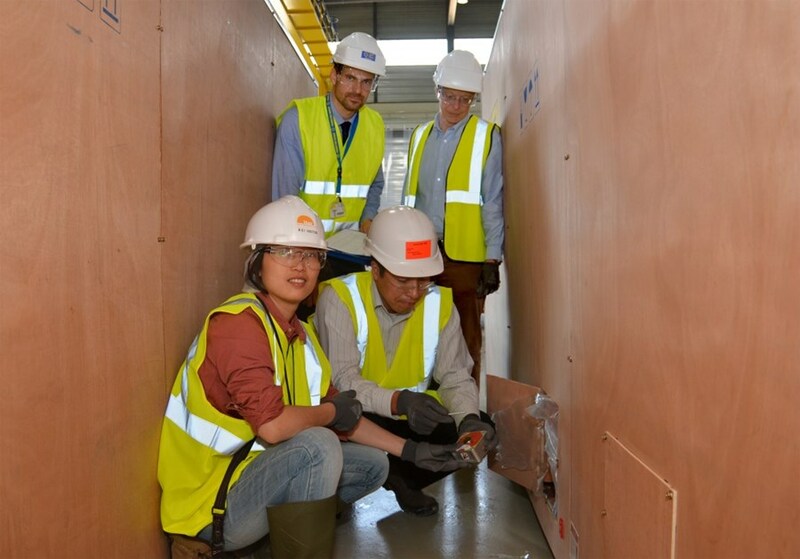 ITER Logistics Contract Coordinator Yanchun Qiao and Sinatrans Project Director Chen Huan extract the ''Black Box'' that has monitored the crates ever since they left Hefei. F4E's Piergiorgio Aprili (left) and ITER's Magnet Division head Neil Mitchell look on. Verifying that the crates (and hence the conductors) had not suffered during the 38-day voyage was the first thing that Piergiorgio Aprili, from F4E, and Chen Huan and Sun Yana, representing the Chinese transporter Sinatrans, did upon the delivery of the load. The integrity of the accelerometers was verified—proof that no major shock had occurred—and the crates' "Black Box" was recovered for later analysis. Compared with the oversized components that will soon be delivered to ITER this week's 14.5-tonne load appeared quite modest. However, for all those involved—ITER China, Sinatrans, F4E, the ITER Organization and the logistics service provider Daher—this was an important moment. 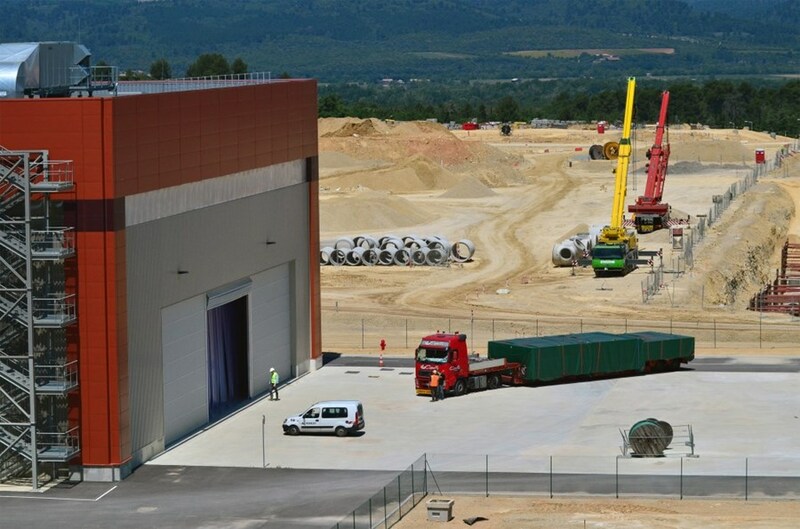 "We have already managed several shipments of small components to and from the ITER Domestic Agencies," explained Daher's Laurence Prudhomme who oversaw the unloading operations, "but this is the first real heavy load we're dealing with." Beginning early next year, the loads will change in scale: several hundred tons, by then, will be routine. View an example of accelerometer data collected during the transportation of the toroidal field conductor from Hefei to the Japanese port of Kobe in November 2012.